people." Such was the banner of the house of Coldarra; yet, any who truly knew the Coldarra name had no such delusions of grandeur. Follow the dark descent of Myrin Coldarra, third child and second son to Duke Coldarra, as he attempts to win the approval of his family and cease the endless onslaught of orcish raids on his home. 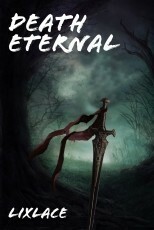 This intense novel reveals the short-lived rise and eternal fall of any who choose to pursue the dark path of necromancy, regardless of the intentions that lead one down the path. This is the first installment of "Eternal Darkness," so feel free to give any feedback!